Who knew I’d be fist pumping “this is awesome” in my head while running around a track?? The track scared me – it conjured up memories of gym class track & field unit which was more humbling than volleyball & was harder to fake then gymnastics. I remember counting laps and it seemed to take forever to reach 4 …and that half a lap seemed like a really far distance for my friends to be head of me. A lot has changed. 14 laps seemed totally achievable and easy to count out. Ok, I may not have known it was 14 laps until I just added up the intervals, but broken up with a max set of 3 laps gave me the “anything for 5 min” mentality. I knew I wasn’t going to be able to join the TFK’s practice last Wednesday night so it was a true test of following a plan and stepping outside of my comfort zone – all by my own motivation. Thomas Jefferson Park track was where it was going to go down. Since I wasn’t going to run until after 8p I decided to switch it to Thursday night when I could head over with plenty of sunlight left. I opted for 6p. I jogged a mile along the east river for my warm up and the crossed over the bridge at 112th street. I thought there might be a soccer game going on but didn’t care – I had seen some people running around the track before. The park was busy! Walking past the playground I saw families – including a few moms making the equipment their gym – awesome! I stepped onto the track and soccer was in full swing. A game was going on in the center of the track for adults but there were plenty of children kicking a ball or a few around. Kids that just learned how to walk were chasing after balls. The moment I took off for my first lap I felt a spring in my step. It was awesome to feel some speed. 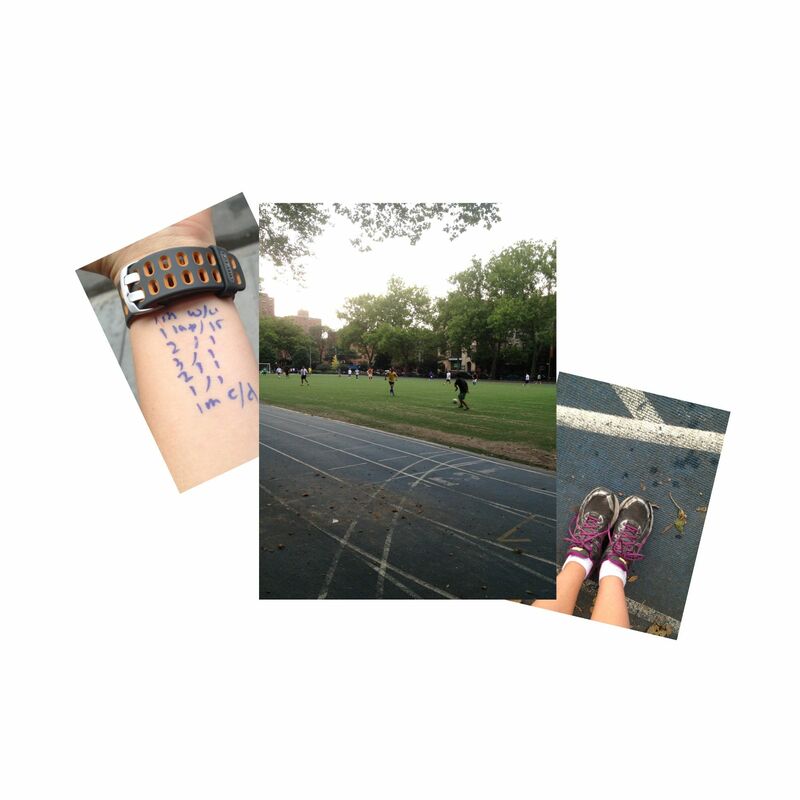 Instead of feeling the plan daunting I thought : 1 lap – look how short it seems now, I can totally knock it out. Recover lap, ok take it slow save it for the next 2 laps to gun it. When it came to doing 3 laps at high-speed it definitely got harder to maintain but I reminded myself that this was the hardest part – not even a mile – I could totally take it on…and the I would get to recover. 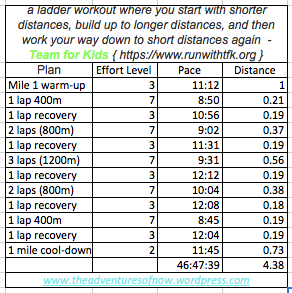 A ladder workout is a total new concept to me – something for “real runners.” But for the first 3-4 laps I was telling myself this is awesome, omg I think I love speed work – is that possible? This why I’ve been pulling back on my other runs and it makes the 12+ mm ok. I was the only woman without children there and I was the minority – but what does that matter? I’m very good at ignoring looks (running in crowded Florence taught me early) and got to watch a (skilled) soccer game the entire time. I’ve been having major soccer withdrawal, so it made my night when I’d kick back a ball to a kid …don’t think they felt the same as they would still have to run after it. Being surrounded by all these kids just added inspiration – as a reminder of who and what I’m training for. I’m fundraising for : bringing awareness to teaching kids how to build their healthiest lifestyle . You can help support, no amount is too little and any is greatly appreciated!! My personal page is: here. Categories: Running | Tags: active kids, family fitness, good run, inspiration, intervals, ladder workout, marathon, marathon training, NYC marathon, quality run, running, running first, Soccer, track workout | Permalink.